Earlier in the day, Nance Jr. said the 1984 dunk contest video was “like normal kids’ Sesame Street.” He even said he watched his father’s highlights Friday night in preparation for his own competition. On his first attempt in the final round, Nance Jr. called on his dad to act as a prop, tossing a lob to set up a fierce windmill finish. But perhaps the most impressive dunk of the night came on Nance’s final attempt as he double-tapped the ball off the backboard before finishing high above the rim, earning him a perfect score. Ultimately, Donovan Mitchell would prevail and take home the trophy after throwing down a dunk that paid tribute to one of Vince Carter’s many iconic dunks. After the competition, Nance Jr. joked that Julius Erving, acting as a judge against a Nance this time around, exacted revenge on him in the scoring stemming from his loss in 1984. Saturday’s performance in the Staples Center didn’t end with the result Nance Jr. was hoping for, but he made history just by participating. Nance Jr. and his father Larry Nance Sr. are the first father-son duo to ever compete in the NBA Slam Dunk Contest. 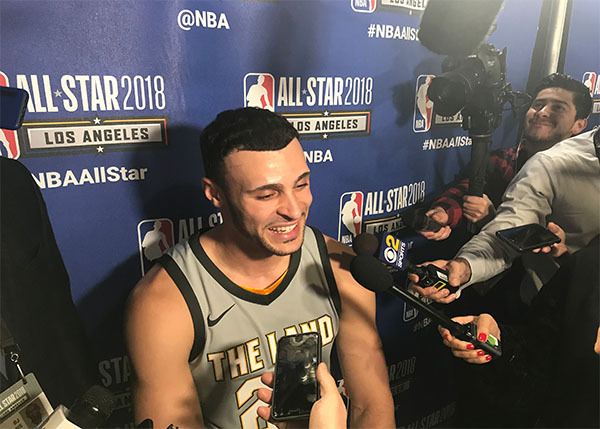 Nance Jr. said his father inspired his devotion to basketball more than any other player he has ever watched and that he has always wanted to be like the former three-time All-Star. Nance Jr.’s career has followed quite a similar path to his father’s. Both made it to the NBA. Each of them was traded to the Cleveland Cavaliers as a part of mid-season deals, and both have competed in the Slam Dunk Contest. While he didn’t hoist the trophy at the end of the competition, the former Los Angeles Laker put on a show in front of his old home crowd. Since he is only nine days removed from being shipped out of Los Angeles, Nance Jr. said he felt right at home in the Staples Center. Saturday night was clearly one the Nances will never forget, one Nance Jr. said he had dreamed of his entire life while being raised by an NBA father. “It was obviously a big moment for my family, something I’ll cherish forever,” he said. Photo at top: The 2018 Verizon Slam Dunk Contest was held at Staples Center in Los Angeles on Saturday night.